CONSTRUCTION of necklaces: the notion that necklaces are always ‘put together,’ in order to be worn. The necklace that is meant to fall apart is still somewhat connected (in order to wear it). However, it looks as if it is falling apart. Jane has ‘tipped’ and juggled the rectangular slabs of beautiful quality labradorite at indiscriminate angles to ‘deconstruct’ the traditional ‘order’ of a standard necklace. 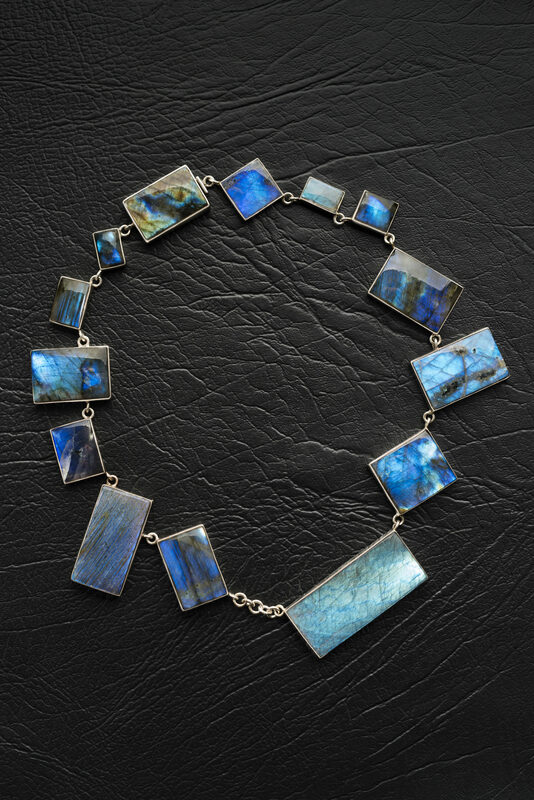 The iridescent slabs shimmer in a variety of royal blues, greys, and tinges of softened turquoise-green (dramatized with accents of black) as the necklace is worn. The labradorite is bezel set in sterling silver. Is it constructed – or deconstructed? Falling Apart Necklaces are connected to the idea of ‘play’ in philosophy and creativity: for out of those practices something different arises. Philosophy also entertains the idea of the Creation-Destruction cycle (where creation follows destruction). This genre of necklace operates within these above parameters.